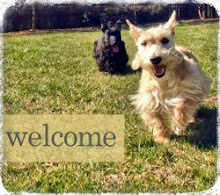 Scottie Mom and kids are home! After a long weekend at play, it is clear we are all exhausted. Heather and Mr. K have only roused to get an extra special moist food meal for dinner. I suspect they'll awake once more for our last walk of the day and then they'll climb into bed once again for the night. From the moment I left them at Pet Paradise, something told me Mr. K would be just fine. In fact, he walked off without even saying goodbye to his Scottie Mom! He simply trotted off in search of the phantom dog barks he heard coming from the group play area. Heather, on the other hand, kept looking back as if to say, "You're coming, right?" I hadn't even made it out the door when they were being placed in their presidential suite and Heather managed to escape and hide under the front desk. Poor girl. The attendant picked her up, I petted and kissed her and told him her secret to happiness: treats! 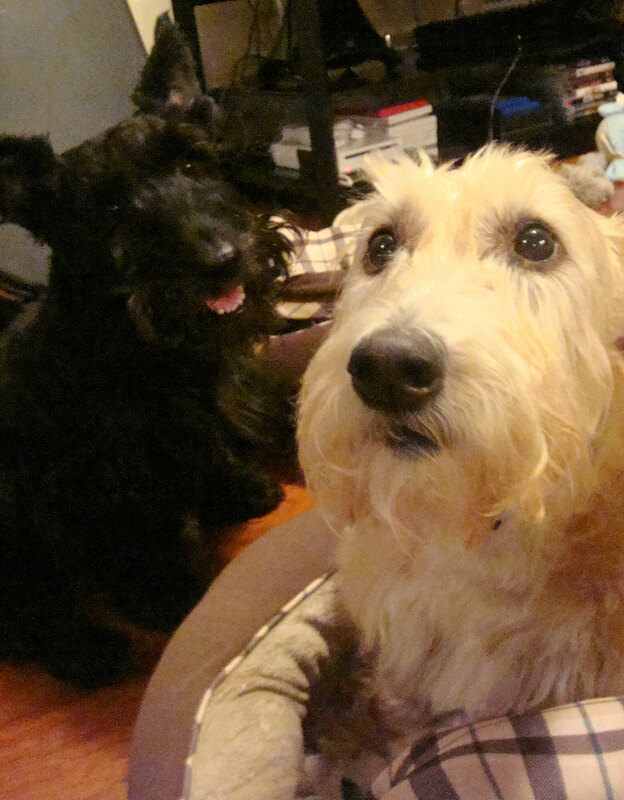 Then, I mustered up my own courage and walked out the door, knowing my Scottie babies were safe in their suite. That night, I logged onto the website and watched them sleep. Together, they were resting on one bed. When I woke the next morning, I was disappointed to see they had been moved as the other dog's mom kept her reservation for the presidential suite. Luckily, though, the staff at Pet Paradise was nice enough to send a photo and a brief update on how things were going. I couldn't have been more proud of Mr. K, who usually gives me trouble when we encounter other dogs, but was a total social hound during his stay at Pet Paradise. It was clear even when I picked them up earlier today, he wasn't quite ready to give up on all the fun. Heather, on the other hand, stuck close to the staff and looked out after Mr. K while he was playing, I am told. I was pleased to get an enthusiastic greeting from my little lady when I arrived this afternoon, especially since Mr. K just assumed someone was here to take him on another adventure and didn't offer much of a "hello" at all! Regardless of Mr. K's apparent lack of enthusiasm, we are all very happy to be home. I expect there to be lots of cuddles before bedtime tonight. And, as it turns out, Heather, Mr. K and I weren't the only ones to have a very Scottie reunion today. 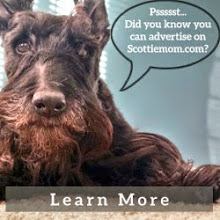 Our Scottie friends in Peru organized a Scottish Terrier meetup and more than 50 Scotties came with their Scottie Moms and Dads. To see photos from this very Scottie reunion, visit the Scottie Mom facebook page. Scotties are resilient. I'd check out Peru, but They won't let me Facebook. I am so happy to learn that everything went well! I understand the apprehension this can cause, but it all worked out. The accomplishment is another notch on Mr. K. and Heather's collar! They are becoming such worldly Scotties!